Jim Phillips watches from the sidelines of the Northwestern-Maryland football game in October 2017. With only a few weeks left in the year, The Daily’s sports desk sat down with athletic director Jim Phillips ahead of the Big Ten Championship Game, where No. 21 Northwestern will play the No. 6 Ohio State with a potential birth in the Rose Bowl on the line. 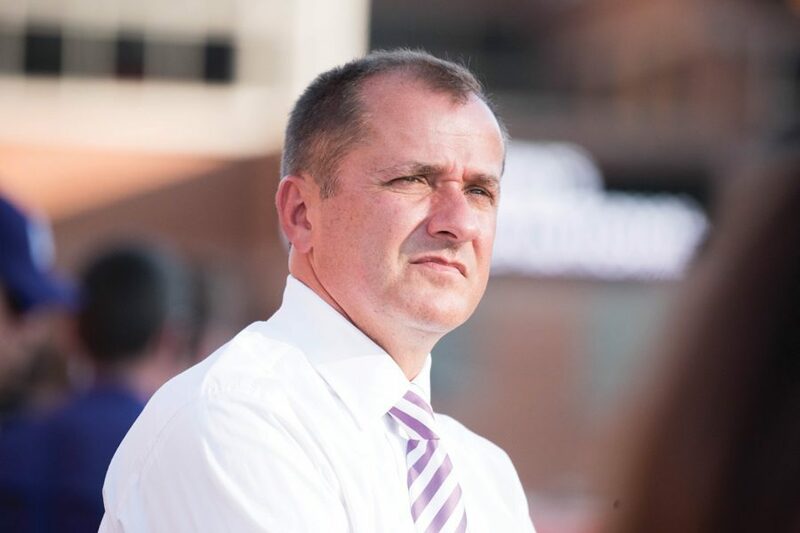 With the Game wrapping up a big year for the Athletic Department, Phillips talked about the new Welsh-Ryan Arena and current construction projects. His answers have been edited for length and clarity. The Daily: How pleased are you with the finished Welsh-Ryan product? What went through your head when you walked in there for the first time? Jim Phillips: I was really proud of how Welsh-Ryan Arena finished. It was a process similar to (the Walter Athletic Center). We went to 64 schools all over the country, spent 20 months or so designing what we thought would be the best fan-friendly, accessible to all and provide that fan experience that people are expecting when they come to games. You have great visions of what it could be but it really has even exceed what I thought it could be. The Daily: Welsh-Ryan hasn’t been close to full for these first few non-conference games. Is that something you’re concerned about at all? Phillips: No. People will come. I want those students to come and we will continue to be really engaged with them. I think it will happen. The Daily: Has construction begun yet on (Howard) Trienens (Performance Center), and if so, how is that going? Phillips: It’s started. That should be completed this summer. It is basketball/volleyball practice courts. It has also has sports nutrition, weight area, sports medicine for basketball, volleyball, wrestling, baseball, softball. And then the back half of Trienens is a full oversized infield for baseball/softball as well as 6-8 hitting bays for baseball/softball and pitching mounds and areas. All of those programs really benefit by us not tearing it down but repurposing that space. It was a pretty large space for football. To be able to split it amongst those five sports is fantastic. The Daily: Any other projects you can tell us about? What is the “next step” in this area for the athletics department? Phillips: There is always things you want to do, but for right now we are trying to do something over at Patten with golf and fencing and those programs. I am excited and anxious to get the Trienens Performance Center done because that will then allow us to open up Blomquist, which we just re-did and it will strictly be for students. Right now, it’s a shared facility with students and with our varsity sports of basketball and volleyball. When Trienens is done, it will open up even more opportunity for our students.